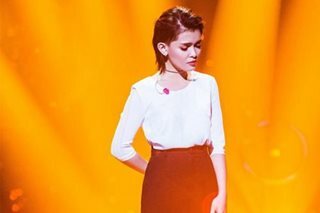 Kapamilya star KZ Tandingan is now officially a regular contender in China's number one TV show, "Singer 2018," after she averaged a ranking in the top four at the conclusion of her second consecutive episode which aired Friday night. (UPDATED) Kapamilya star KZ Tandingan is now officially a regular contender on China's No. 1 TV show, "Singer 2018," after she averaged a ranking in the top four at the conclusion of her second consecutive episode which aired Friday night. Tandingan, who took the stage with a medley of Mandarin songs, ranked sixth out of eight in the new episode of "Singer 2018," her second since joining as a challenger. While her latest ranking is lower compared with her debut episode, where she placed first ahead of her idol Jessie J, those two rankings averaged together helped her avoid being eliminated. The "Singer 2018" format requires a challenger, such as Tandingan, to have an average ranking not below fourth place after her debut and second performance, in order to become a regular contender. The average of her first two performances on the show was enough to secure her a permanent slot in "Singer 2018." This means that, in upcoming episodes, she can only be eliminated if she happens to rank last overall as determined by audience votes. In a press conference early this week, Tandingan said her "dream performance" on the show would be to sing a rendition of the iconic "Anak" by Freddie Aguilar, sung both in Tagalog and Mandarin. "I want to show my respect to the Chinese audience, Chinese culture, Chinese music," Tandingan said in an interview shown before her performance on Friday, explaining why she opted to sing a Mandarin medley. Tandingan, whose showbiz career started via "The X Factor Philippines," is aiming to stay until the April 13 live finale of "Singer 2018." While she is not aware of any monetary prize for winning overall, Tandingan has said she considers the exposure to the hundred millions-strong Chinese audience an incomparable award in itself.